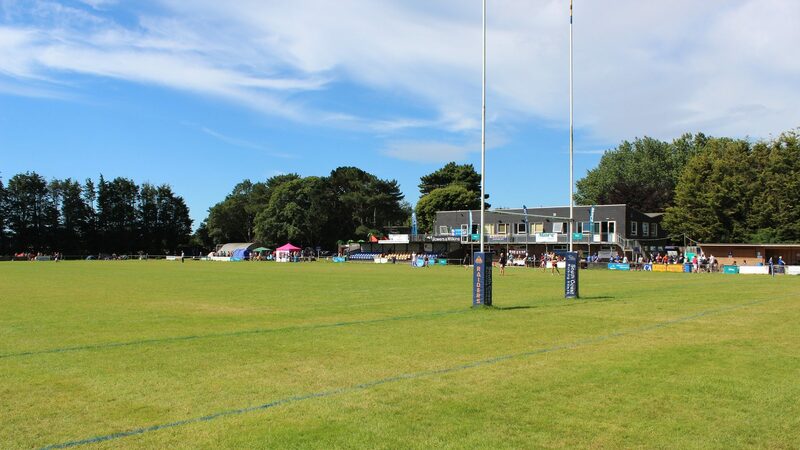 Canterbury RFC visit Roundstone Lane this Saturday to renew rivalries in what always seems like a derby match, despite the fact that it is at least a 200-mile round trip for the players and supporters. It is, of course, their 9th visit to us for a National League 2(S) fixture and when added to the other fixtures played over the years, in the London & SE leagues, as well as ‘friendly’ matches it is probably our longest standing fixture. Canterbury RFC (aka ‘The City Club’) was founded in 1929. In those days a high percentage of the playing membership were involved in the Agricultural Industry, so the season didn’t really get moving until after harvesting. In 1937 the club moved to the present ground in Merton Lane, which is now known as MTG (Marine Travel ground). The Mayor of Canterbury opened the playing facility, although changing and post-match discussions were still held at a local pub, ‘The Fleur de Lys’. In the early 1990s the club was wallowing away in Kent 2, but by season 2006/7 promotion to the National League 2 South was achieved. The onset of a strong mini/junior section being at the heart of this transition. Canterbury finished a very creditable 4th in their first season in the National League. Season 2010/11 saw relegation by a whisker, on the last day of the season, but a bounce straight back the following year was achieved following a virtually unbeaten season. Canterbury RFC, like ourselves, is a true Community club running 4, sometimes 5, sides on a Saturday. The club are also involved in a potential ground move. Junior and Mini Rugby for age group 7-U18 takes over on Sundays. The Ladies XV play in the National Challenge South East 1 South, the same league as our Ladies. Wheel-Chair Rugby has been added to the club’s activities, now in their 4th season. The official club colours are black and gold. Raiders travelled to a rather wet Canterbury with a few changes to the side. They had the benefit of the slope in the first half, but the wet conditions ruled with handling becoming more difficult as the weather worsened. Raiders took the lead after 15 minutes with a Matt McLean penalty, but Canterbury picked up a couple of converted tries to lead 14-3 at the break. Liam Perkins scored in the 56th minute with Matt McLean’s conversion to take the score to 14-10, but almost immediately the home side broke through for another converted try to restore the differential. Raiders continued to press for a score to at least provide a bonus point, but the Canterbury defence held out. Canterbury: Moss, Mackintosh, Goatley, Sterling, Murray, Young, Smart, Cooper, King, Kenny, Cadman, Corker, Whetton, Stapleton, Stephens. Bench: Braithwaite, Otto, Green, Grimes, Oliver. Raiders: Forrest H, Boyland, Forrest J, Sims, Barnes, McLean, Walsh, Birch, Luke, Adams, Lake, Lee, Harris, Dawe, Perkins. Bench: Grief, Sassone, Gatford, Maslen, Hammond. Another middling season. Never any real danger of the team being dragged into relegation territory. Their home form remained solid with 9 wins. The spoils with nearby rivals Tonbridge Juddians were shared although the away team won each leg (24-36 at The Slade, 19-22 at MTG). Leading points scorer was Ollie Best with 105 points. Leading try scorer was Harry Sayers with 15, closely followed by Aiden Moss on 14. Lock forward Matt Corker was in involved with all 30 matches, scrum half Dan Smart featured in 29. As usual a list of the players used in the last fixture against Titans is provided along with detail on a few other players who have been used recently. The appearances column is perhaps a clue to the success of the side with many of the players with 15+ against their name. The boiler house combination of Royce Cadman and Matt Corker starting every match, with the front row of Messrs. Cooper, King and Kenny only missing a handful between them. The three-quarter line up selection has also been the model of consistency. The back three having notched up 26 tries between them. This fixture is normally a must see event, but this time around there seems to be just a little bit of extra spice to it. Both sides look to score tries so this should make for a grand spectacle. Please try to get along to provide that much valued touchline support for the boys!!! Aiden Moss* (26) 17/1R 147 2012 11T Eng Counties U20 Kent Full Back: Blackheath 4. Lock: Thanet Wanderers, Wasps 5, Blackheath 16, Havant*11, London Welsh(c) 228, Richmond 22. Jim Green* 3/13R 144 2010 1T Kent LH Prop: Westcombe Park 11.